Even though their homes may be worth less than what they owe, homeowners even with a low personal credit score can still refinance their mortgage based on the guidelines which ideally target a 25% income to debt ratio. 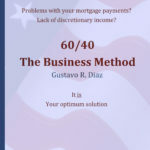 according to the rules of parts A and B of the 60/40 Business Method. The new mortgage payment will be about half of a conventional mortgage which will leave the homeowner with a discretionary income of about 45%.